URBANA, Ill. – Following the severe storms last week, Illinois soybean producers are beginning to notice seedling damage due to two soil-borne pathogens. “In many cases Rhizoctonia has been identified as the causative organism, alone or in combination with other soil diseases such as Phytophthora,” says Nathan Kleczewski, plant pathologist in the Department of Crop Sciences at the University of Illinois. Rhizoctonia kills germinating and emerging seedlings, but the disease also affects larger plants by forming stem cankers, or sunken lesions, at and slightly above the soil line. Large cankers can severely reduce the translocation of water and nutrients up the stem, causing the plant to wilt and potentially die. Affected plant tissues tend to appear reddish-brown and will have a corky, almost dry-rotted look to them. Rhizoctonia becomes problematic when soils are moist and warm, forming patches within a field. Soybean varieties differ in their tolerance, but unfortunately there is no true resistance to the disease. Kleczewski says Rhizoctonia seed treatments can be effective for reducing early infections. However, he says, these products are only effective for the first week or two after planting, and are unlikely to impact disease occurring later in crop development. Producers should also expect outbreaks of Phytophthora in the coming days, especially in low-lying, poorly drained areas of the field. Phytophthora lesions on stems are black to brown and extend from the roots up the lower stem of the plant. The margins of the lesions are less defined than in Rhizoctonia-infected plants, and are soft and mushy. Fortunately, two types of resistance are available for management of Phytophthora: race-specific (Rps) and partial. “Race-specific is similar to a door that will completely block specific types of Phytophthora from infecting plants. However, some Phytophthora individuals contain a key that allows them to open that door and infect roots. 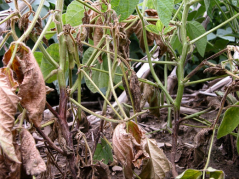 Thus, if a variety with an Rps gene (door) is planted into a field with a Phytophthora population that is comprised of individuals able to overcome that resistance (key), you may still see significant infection,” Kleczewski says. The most common Rps genes are Rps1a, Rps1c, Rps1k, Rps3a, and Rps 6. Although many varieties only have a single Rps gene, some have multiple, or stacked, Rps genes. Partial resistance is not expressed until later in plant development, typically after the first true leaves are produced, and therefore is not effective for managing early infections. Like Rhizoctonia, seed treatments can provide benefits early in the season. Kleczewski points out that Phytophthora is not a true fungus, but an oomycete, and therefore seed treatments must contain oomycete-specific active ingredients such as metalaxyl, mefanoxam, or ethaboxam. “In a case like this, it is important to realize that seed treatments are not going to help much. We are 30-45 days post planting and your fungicide treatments ran out of gas a while ago. Seed treatments are not soil fumigants,” Kleczewski says.